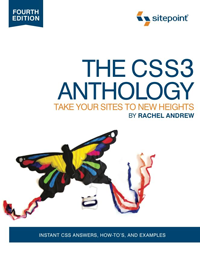 We’ve teamed up with SitePoint to give you the chance to win one of five free digital copies of their latest book – The CSS3 Anthology: Take Your Sites to New Heights by Rachel Andrew. The book is available as a digital ebook bundle (including PDF, Kindle and EPUB versions of the book) as well as in print format. For a limited time only, until April 10th 2012, the ebook bundle is available at a specially discounted price of only $17. Find the answer in the final chapter of the FREE sample PDF (of the book) available from SitePoint here. Think you know the answer? Just complete the form below to enter. The competition closes at 9pm (BST / GMT+1:00) on Thursday 5th April. Five winners will be picked at random from all correct entries received, and the winners will be notified via email and published here on CSS3 .info on Friday 6th April. Thanks for the chance and when you said full name I made sure its was my fulllll name. Can not wait for your email. This definitely looks great! The first several chapters look like they are well written for beginners, yet I’d love to read chapters 4 through 7 even though I consider myself somewhat experienced.